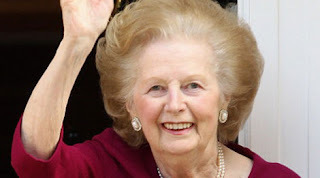 Magaret Thatcher's who was known as the Iron lady or Britain's fighting lady has been confirmed dead.Her son, Sir Mark, and daughter Carol confirmed that she died this morning. Lord Bell, her spokesman, said: "It is with great sadness that Mark and Carol Thatcher announced that their mother Baroness Thatcher died peacefully following a stroke this morning. A further statement will be made later." Lady Thatcher died at the Ritz hotel at about 11am after suffering a stroke. Her children were not at her bedside as they were abroad. Her doctor and carer were there when she died. Buckingham Palace said the Queen was saddened by the news. David Cameron, the Prime Minister, said: "We've lost a great prime minister, a great leader, a great Briton. "She didn't just lead our country, she saved our country, and I believe she'll go down as the greatest British peacetime prime minister." Flags have been lowered to half mast at Downing Street. Many features of the modern globalised economy - monetarism, privatisation, deregulation, small government, lower taxes and free trade - were all promoted as a result of policies she employed to reverse Britain’s economic decline. Above all, in America and in Eastern Europe she was regarded, alongside her friend Ronald Reagan, as one of the two great architects of the West’s victory in the Cold War. Of modern British prime ministers, only Lady Thatcher’s girlhood hero, Winston Churchill, acquired a higher international reputation. Lady Thatcher had become increasingly frail in recent years following a series of small strokes in 2001 and 2002. Ill-health had prevented her attending an 85th birthday party in Downing Street arranged by David Cameron in October 2010. It also prevented her attending the Royal wedding of Prince William and Kate Middleton on April 29, 2011 at Westminster Abbey. Lady Thatcher published two volumes of memoirs. The first, The Downing Street Years (1993), covered her time as Prime Minister, while the second volume, The Path to Power (1995), concerned her early life. She also published a magisterial volume on international affairs, Statecraft (2002). She is survived by her two children. Her husband Sir Denis died in 2003.